To create a page in your account, click on ‘Pages’ listed in the left margin. Select ‘Add a New Page’. Enter in a Page title, select ‘Add New Page’, and your page has been created! Now let’s add some content. Save- Saves your page update. Save and Notify- Saves your page update and notifies those on the notification list assigned to that page that changes have been made. Restore- Restores the page to one of five previous save points. *NOTE* Once you have finished editing your page and you wish to send notifications to parents that recent updates have been made, you MUST click on "Save and Notify". You are now ready to add your content. Feel free to add as much or as little information as you want, the sky’s the limit! You can be as creative or as basic as you would like, it’s up to you. *Helpful Tip* - We recommend that you ‘Save’ your work as you go. The internet is an unpredictable place and to prevent a loss of work (and a waste of your precious time!) it’s a good idea to ‘Save’ your work periodically while you are drafting your update. 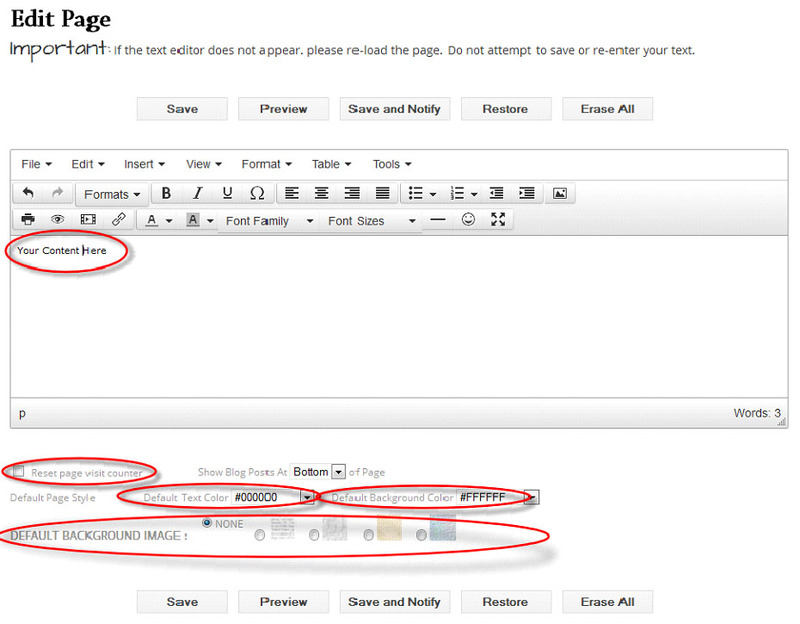 Below the editor window there are additional page formatting tools. You can set a default text color, as well as set a default background color or a background image/pattern. Pasted MS Word content contains a lot of embedded styling that works well in MS Word, but behaves poorly on a website. The best strategy is to paste plain text into the editor and format it with the editor's formatting tools. This can be done by pasting your content into a Notepad document first and then copying and pasting from that document. This will remove the formatting that does not behave properly on the web. There is also a plain text mode within the editor settings; this will allow you to skip the Notepad step. 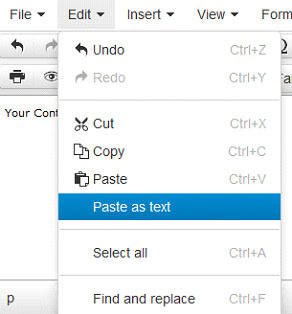 An additional note about the editor, in order to copy/paste/cut you will need to use the standard keyboard shortcut keys- Ctrl+C (copy), Ctrl +V (paste), and Ctrl+X (cut). The last feature available when creating/editing your pages is the ability to manage your Links, Files, Photo Albums and Flashcards assigned to the page. Simply click the check box for those items you want to feature on that particular page and click ‘Save’.